The other night I was thinking about this, and I wondered: What if that blood isn’t about suffering or death? What if it’s not about losing one’s life force, but rather extending it? Maybe the key is to turn the blank page into a vein. 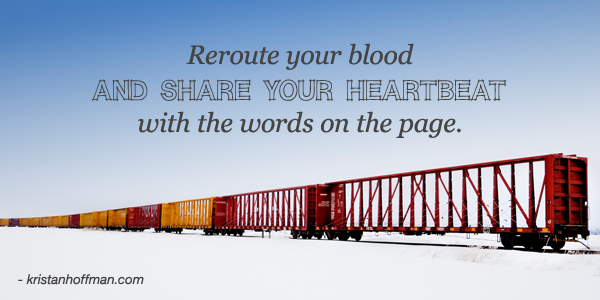 Reroute your blood and share your heartbeat with the words on the page. Make your story a part of you, a new appendage. I’m going to try it. I’m going to write my body into a million sentences, to fill the space between covers. I’m going to let people slip underneath my skin and read my pulse. I’m going to bleed my life onto the page. I always read that quote as bleeding your heart and soul into words rather than sorrow. Whatever the contents may be. Oh? Haha, maybe the glass-half-full interpretation is more common than I thought… It’s just that the opening sentiment (writing is easy) is so laughable/sarcastic that I assumed the rest must be grim to match. I always take Hemingway with a grain of salt when he talked about writing (assuming he actually said that in the first place).Particularly in his later years, he was usually performing a part: Papa, the championship writer of the world. I will cheerfully read his fiction again and again (particularly his short stories), but, as an article I read recently pointed out, when he was writing as himself, not as a character, he invariably became either mawkish or boastful. Or both. But in any case, why should blood mean anything negative? We’d all be in a pretty mess without it after all. Blood is just life — a part of both birth and death, and everything in between. A few weeks ago I thought suddenly of all the ways that I my current story relates (indirectly) to my mother’s recent death. It’s not a gloomy story (well, people get murdered, but that’s my genre), but I like to think it’s got some blood and life in it. Oh, totally agreed, re: Hemingway. I’m so sorry for your loss. I have no doubt that the “blood and life” of what you’re going through is making its way into your work and shining through. Aww, well every little bit counts. Good luck! Go go go!